Stay Inside Yosemite National Park at the Hummingbird Raven House! Please read our full listing before sending a reservation request. Yosemite West is inside Yosemite National Park. It is a 25-35 minutes drive to Yosemite Valley attractions, 30 minutes to Glacier Point and 30 minutes to Mariposa Grove and Wawona. This is also the closest lodging for Badger Pass Ski Area, with downhill and cross country skiing and snowshoeing - only eight miles away from your door. This Yosemite West home is located close to the Glacier Point Road, so you are very close to Taft Point and Glacier Point, the most spectacular views of Yosemite Valley. This house sleeps a maximum of 8 people. Please note if you have a larger group that this house has 1 1/2 bathrooms, and only 1 shower. If you need 2 showers, please check out our other Yosemite West rental home, the Hummingbird Pines House (VRBO 470093). Minimum age of primary renter: 25. Pricing is $325.00 base price for up to 2 guests. $25.00 per night for each additional guest per night after the first 2 guests. The Hummingbird Raven House has a spacious deck high in the trees which is a wonderful place to eat dinner and enjoy the sunset. Please note that our house has a spiral staircase which may be difficult for elderly folks and small children. Our other Yosemite West vacation home, the Hummingbird Pines House (VRBO 470093) is more suited to elderly guests as it has only 2 steps into the house and bedrooms on the ground floor. We accept dogs on a case by case basis. We do not automatically accept all dogs. We only accept dogs who are not left unattended in the house or on the deck. There is also a fee and pet deposit required. The master bedroom has a king size bed and a half bath. Upstairs are two additional bedrooms, with a queen size bed and four bunks. All beds have down comforters and pillows. A convertible sofa-bed in the office sleeps 1 to 2 more guests. Note: we cannot accommodate more than 8 guests at a time. This house is equipped with a full kitchen and a large dining table. There is a bbq and dining furniture on the deck, which is a wonderful place to enjoy dinner and watch the sunset. Like most homes in Yosemite West, the Hummingbird Raven House does not have air conditioning. We do have individual room fans. Our location is 6,000 feet of elevation, so generally remains cooler than Yosemite Valley. Peter and Michelle We have visited and loved Yosemite for many years, and are thrilled to have vacation rental homes in the park. We love Yosemite for hiking, climbing, snow shoeing, wildlife viewing and spending time in nature. Please feel free to email us with questions! Yosemite West is inside the Park boundaries, so it's a perfect location to enjoy Yosemite (20 minutes to Yosemite Valley and Glacier Point, and close to various trailheads). It has the advantage of being very close to the Badger Pass ski area, and being at a higher elevation than the Valley, which keeps the temperatures more comfortable in the summer months. The deck is a wonderful place to enjoy dinner and summer sunsets ! Our large deck is a wonderful place to share meals and watch the sunset. We hope you enjoy our house and the park as much as we do! The property, was clean, cozy, and comfortable and most important the perfect location to visit all points of interest. We would definitely stay again ! Thank you Michelle and Peter. Clara, thank you so much for staying at the Hummingbird Raven House, and we're very happy you enjoyed our house and Yosemite. Happy New Year! A bit funky, but functional! The property is in an excellent location for exploring the Valley and Glacier Point. Check in and out is very easy (lock box). The floor plan is a bit strange - but functional. There is no internet or cell service, which, for us, was a benefit. We made use of the games and puzzles at the place! We really enjoyed the Yosemite West location. The windows and deck of this cabin are beautiful but overall everything else felt worn-down. The kitchen is not well appointed and is missing some integral basics like small cereal spoons, a cheese grater etc. The rug & cloth dining room chairs felt dirty. The sofas are well worn and there was not enough comfortable living room seating for 4 adults & two kids. The bedrooms were clean and comfortable, though poorly lit. The only downstairs toilet in the master bedroom has a curtain door. The spiral staircase is narrow and rickity & after staying here with a 3 & 6 year old I would not recommend any child under 7 to stay here. There is at least 1 baluster that is broken. The hosts were kind and accommodating prior to arrival. However we had a problem with the oven locking while in use & we were not able to reach them on the cabin landline. Thank you for staying with us, and we're very sorry about the issues you've raised. We will discuss everything with our housekeepers, as it is important to us that our guests are comfortable. We didn't receive a phone message from you, so we're not sure what happened there. We also conspicuously post our maintenance man and housekeeper's phone numbers for immediate assistance, as they are in Yosemite West. We will look into the issue with the banister you mentioned. We were at the house several weeks ago and there wasn't anything broken on the stairs, but we will definitely look into that. We have photos of the spiral staircase on our listing, and we say the following on our listing so that guests will be aware: "Please note that our house has a spiral staircase which may be difficult for elderly folks and small children." We loved staying at Michelle and Peter's place! Our group of four really appreciated having a nice, clean cabin to come back to each day after hiking and sightseeing. The beds are comfortable and there are plenty of pots and pans, dishes and utensils. Michelle and Peter were responsive with questions and helpful in suggesting hikes and other things to do. A great experience, and we'll be back! Thank you for staying with us, and we're so glad you enjoyed our home and Yosemite! Great house in wonderful setting. All arrangements worked well. Thank you. 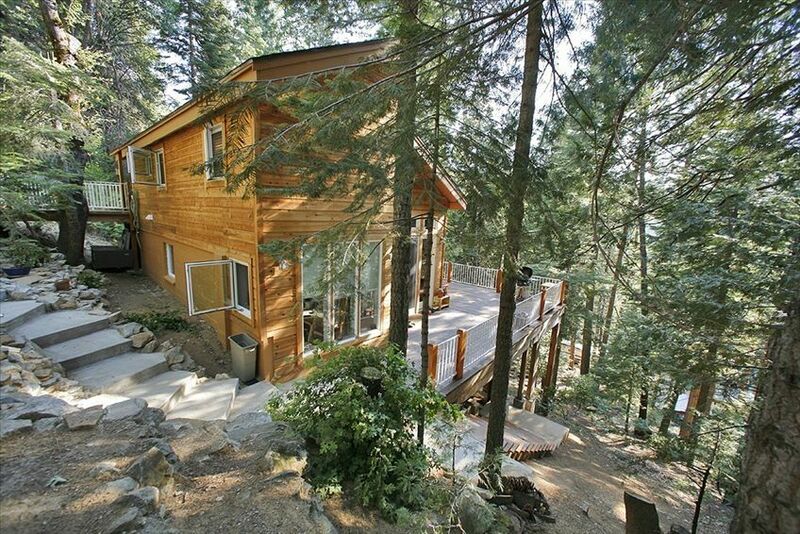 A great forest cabin within 30 minutes drive of Yosemite Valley. We enjoyed four days of ideal weather in mid October, hiking and driving to all parts of the Park. Met with two bears , coyotes and racoons. Can recommend the Tuesday evening talk on Search and Rescue at the Visitor Centre theatre; and gazing at climbers' head torches on El Capitan at night. The house suited us fine- we were three generations w a two year old who loved it. Thank you for staying at the Hummingbird Raven House! We're really glad you and your family enjoyed our house, and happy for you that you had some great wildlife sightings! Well located property. Plenty of space. There is so much to do in Yosemite; please contact us for information on hiking, sight seeing and other activities. RATE INFORMATION - PLEASE READ CAREFULLY! $325 per night base rate 2 people. Each additional guest including children adds $25.00 plus tax. No charge for 2 children under the age of 3. Pets count as an extra guest and are only accepted at our discretion. Cleaning fee of $100.00. Minimum age of primary renter: 25.